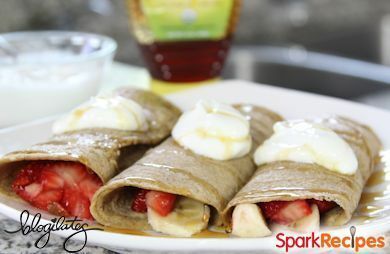 This delicious breakfast (or dessert) comes together in minutes but looks as good as it tastes! This delicious breakfast (or dessert) comes together in minutes but looks as good as it tastes! If you don't like bananas, you can substitute another soft fruit like a mango. When you pour the batter into the frying pan, make sure you coat the pan in a thin, even layer. Watch recipe creator Cassey Ho demonstrate how quick and easy it is to make this recipe! Be sure to subscribe to Cassey's YouTube channel for weekly additions to the "Cheap Clean Eats" series, as well as fun workouts!